China is one of the most amazing places on the planet. I love the people, the culture, the food, the language, and the scenes. Here are a few photos from the ancient water city of Wuzehn near Suzhou, and a couple other random shots from other places, too. Bonus: If you are coming to China, be sure to see my page of tips for survival: Surviving in China (a work in progress). 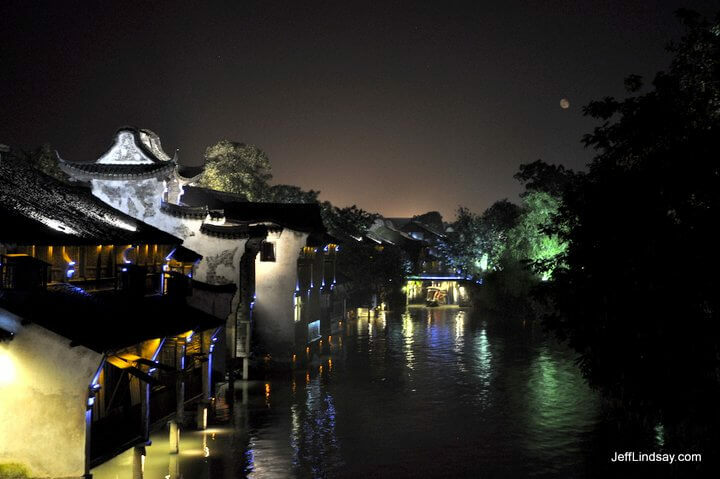 The beautiful ancient water town of Wuzhen, near Suzhou. 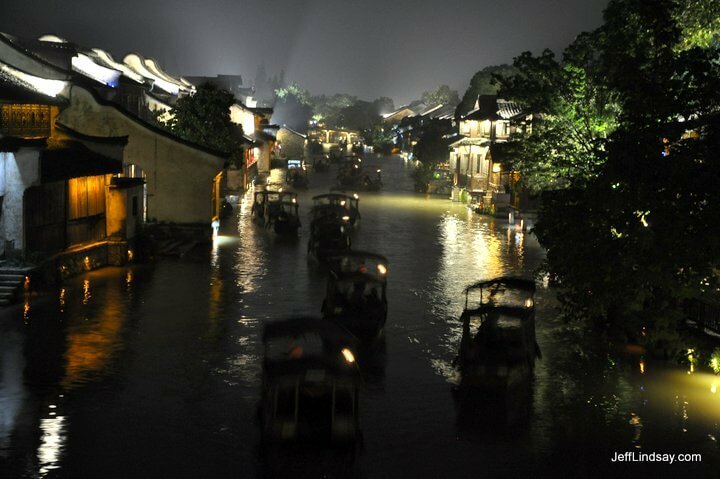 To me, this is the Venice of China. A view of the main canal at night, June 2011. 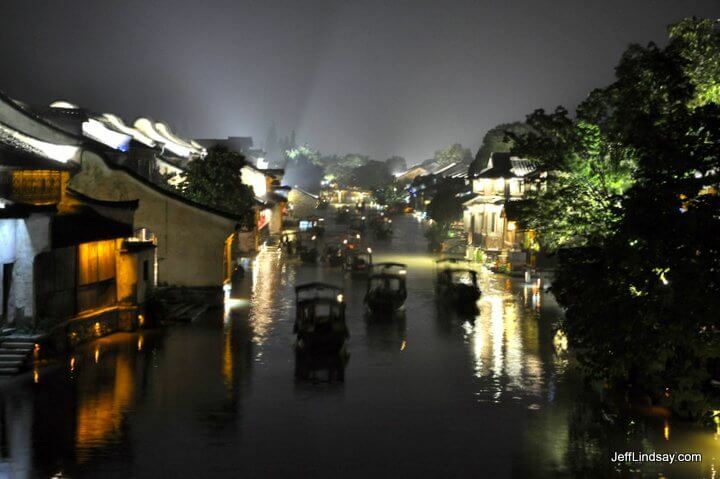 Another view at night of the water town, Wuzhen, China. 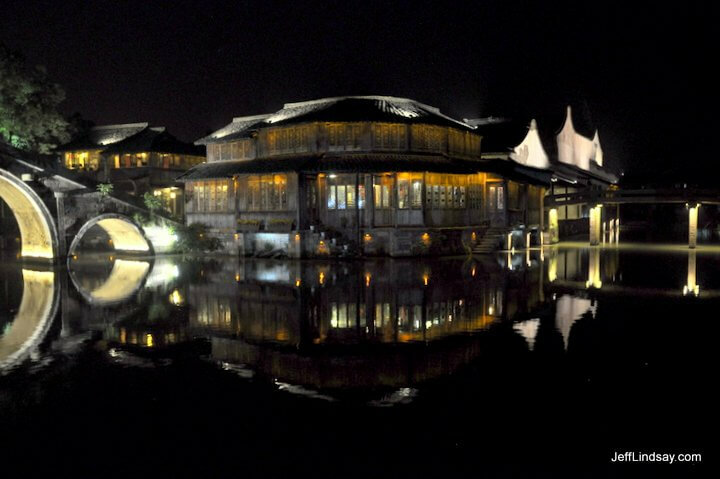 A corner of Wuzhen glistens in the night light. 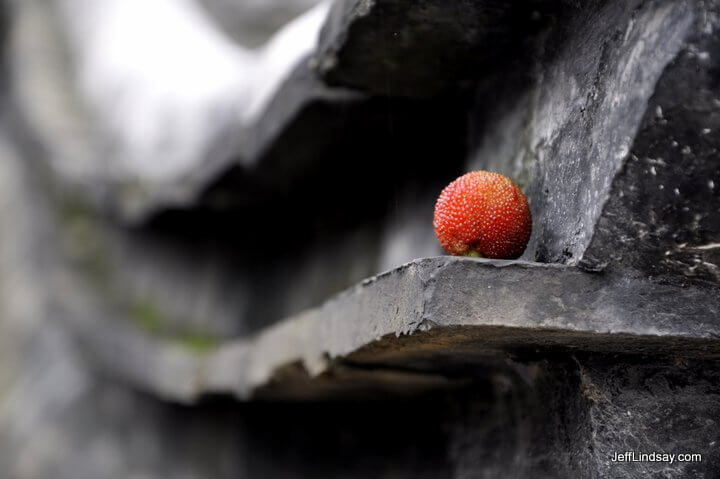 A fallen waxberry fruit landed on this portion of a roof near a bridge in Wuzhen village, China. Glad I walked by and noticed it. 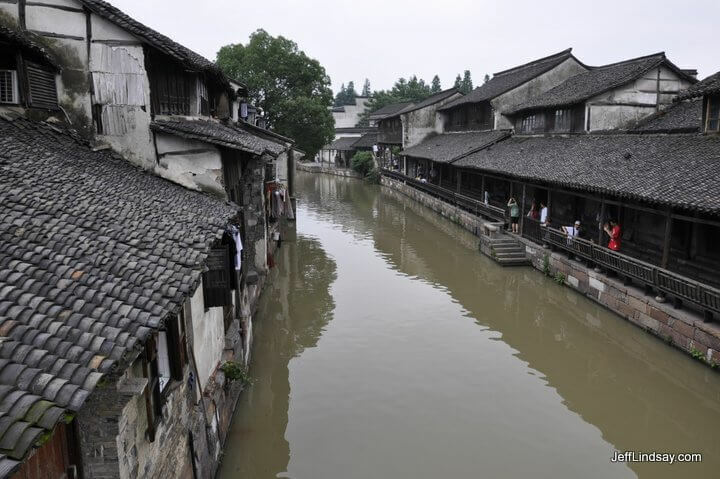 A canal scene in Wuzhen. 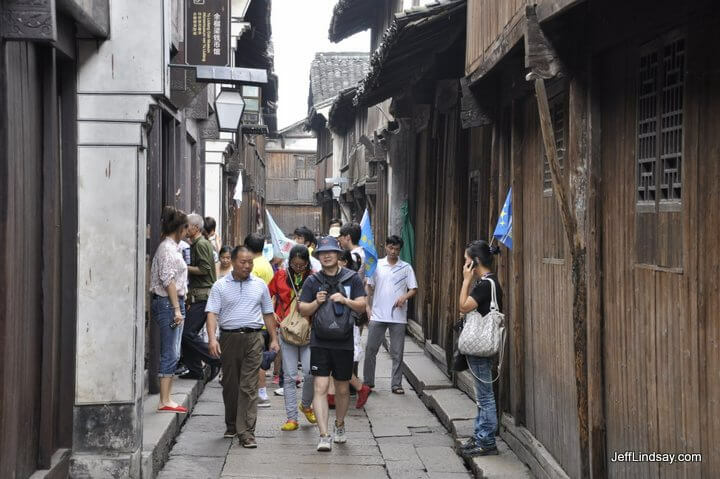 A street scene in Wuzhen. A bridge over the canal in Wuzhen. 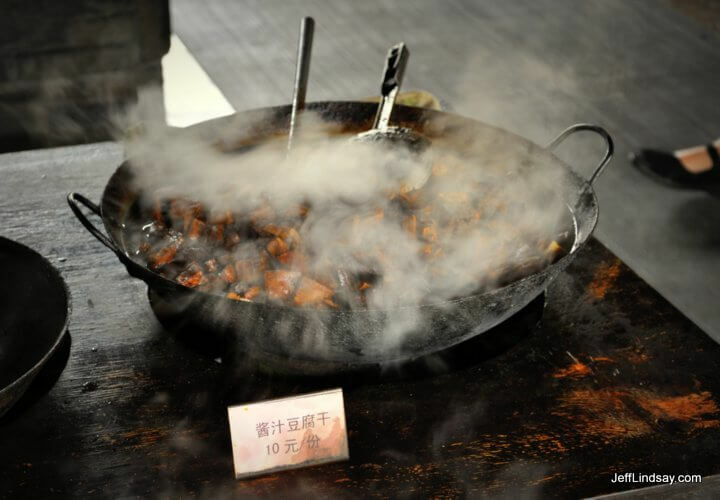 A tofu dish being cooked and sold at Wuzhen. 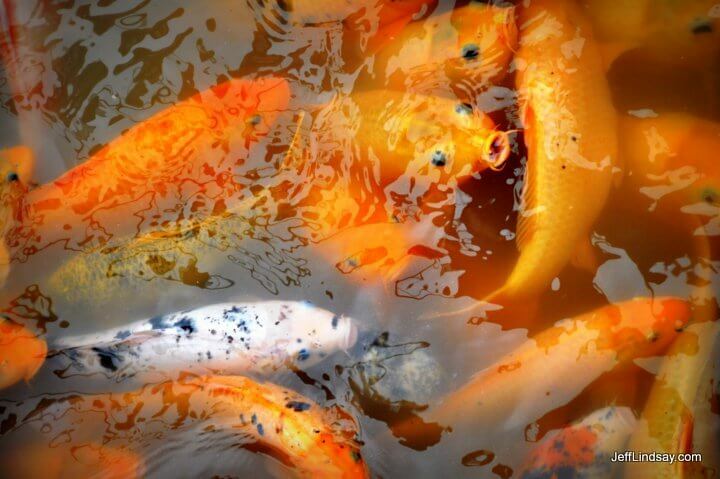 Koi, or Chinese goldfish, in a pond at Wu Zhen. June 2011. 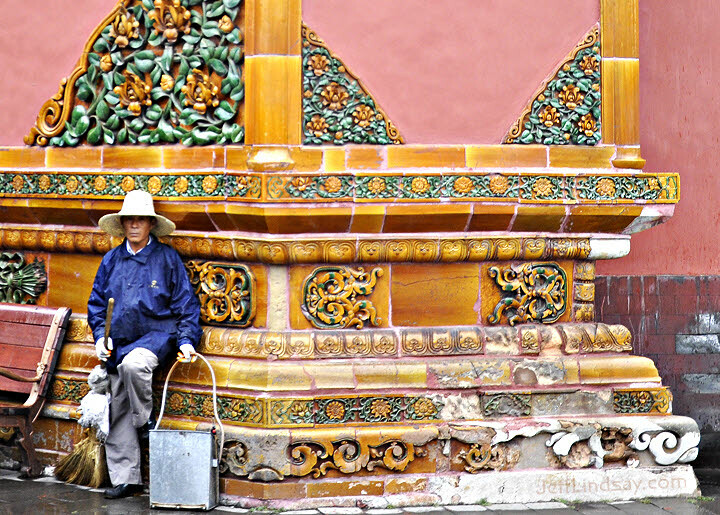 A worker at a wall in the Forbidden City of Beijing, Sept. 2011. 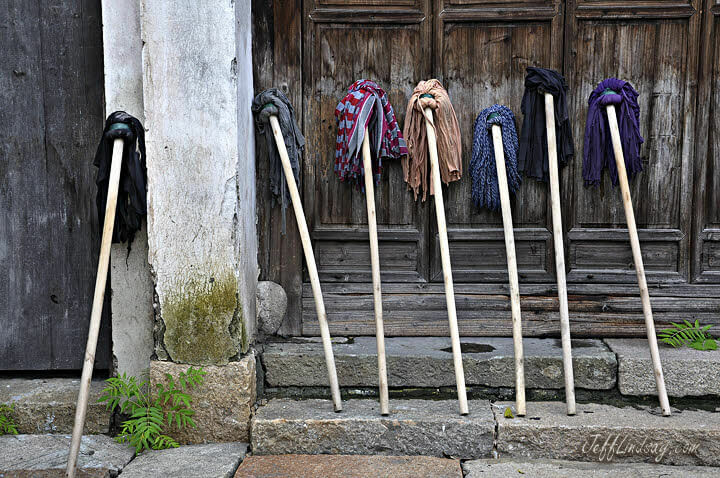 Mops along a wall at Wu Zhen. Lesson: Feeling excluded? Being part of the cool gang might not be as exciting as you think. 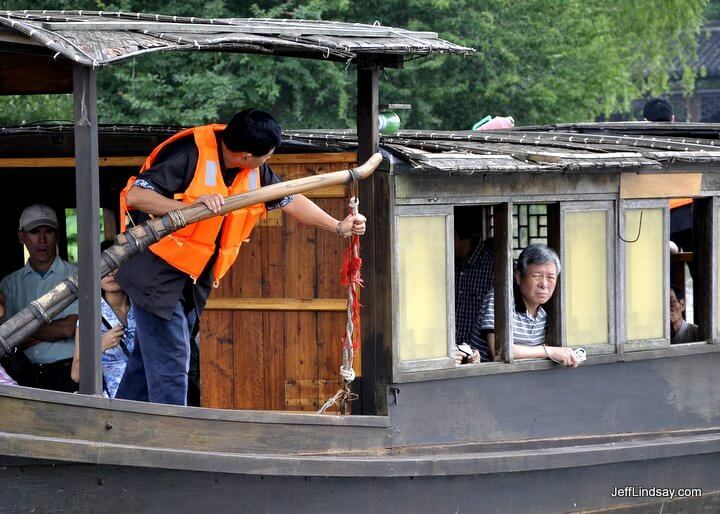 A boat at Wuzhen, China, with a contemplative tourist. 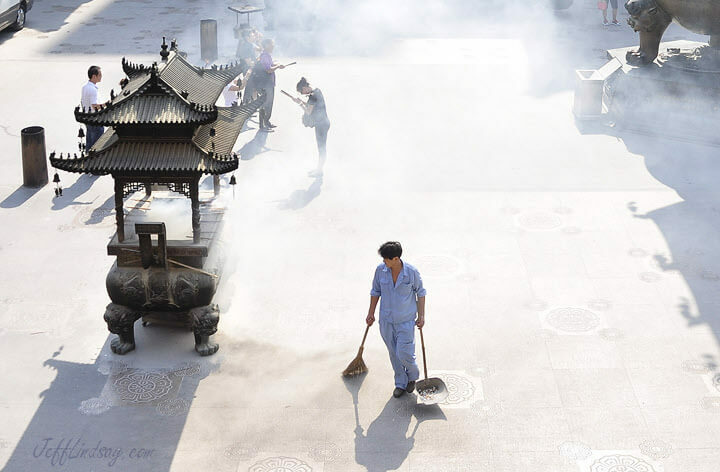 A view within the Jingan Temple in Shanghai, Sept. 2011. Burning incense and candles adds to the atmosphere at the temple. While some worship, others clean. 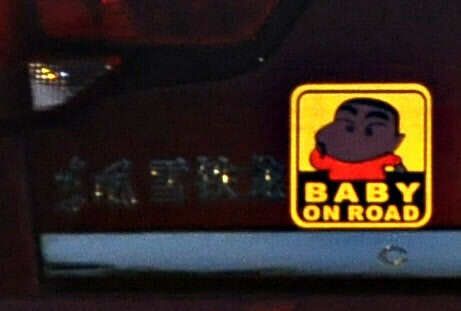 "Baby on road": perhaps they meant "Baby on Board"? This was a sticker on a car in front of us, photographed while on the road near Suzhou, China. 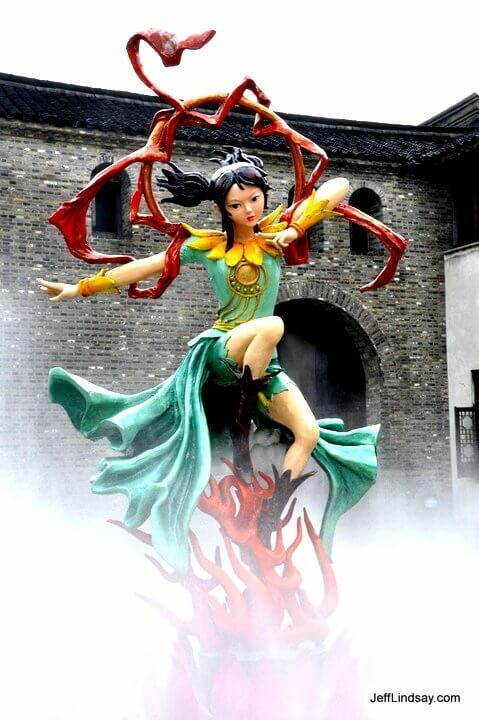 Another view of a mythical statue at Wuzhen. 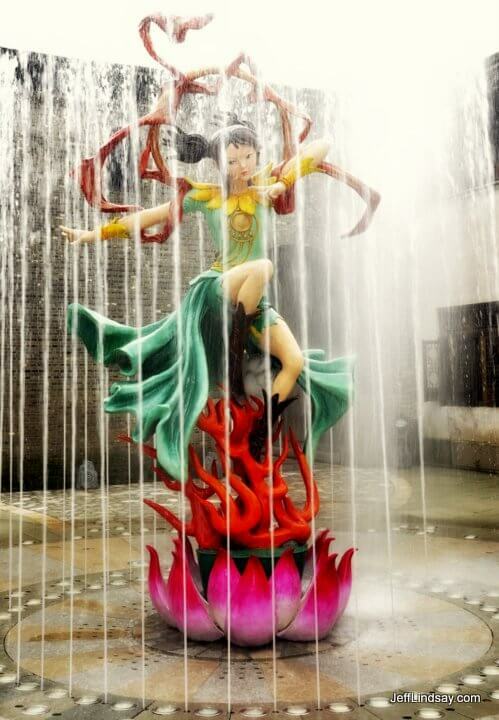 Another view of the superhero goddess of Wuzhen. 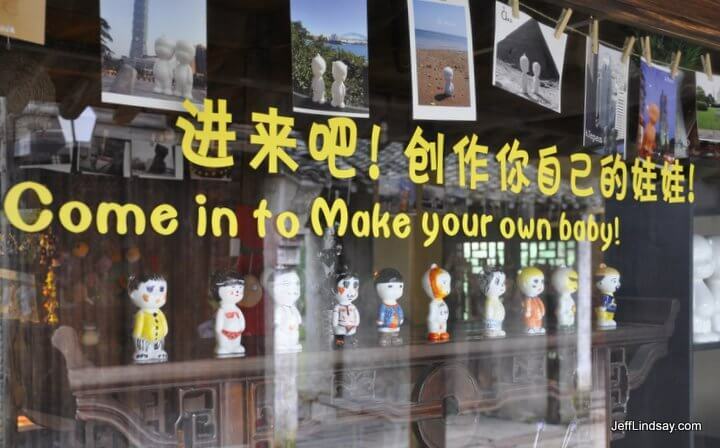 A shop in Wuzhen: "Come In and Make Your Own Baby." I'm not sure I understand what their business model is, and I was too embarrassed to ask. 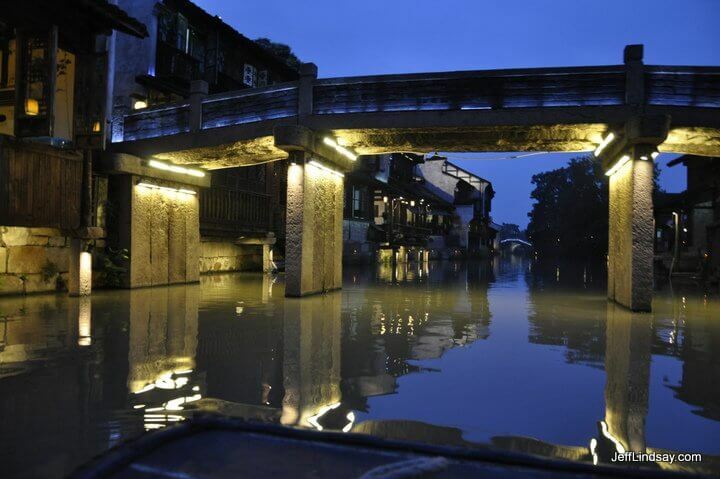 Boats at night on the main canal in Wuzhen. 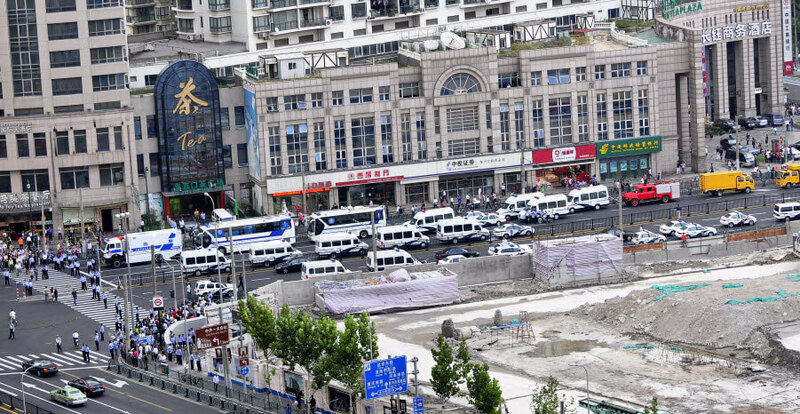 Shanghai had subway crash on the line I ride near my home on Sept. 27, 2011. Here are some photos taken from our apartment building showing ambulances on the street above the Lao Xi Men subway station on line 10 where many dozens of injured passengers were being taken away for treatment. A painful setback for a truly brilliant subway system. Last updated: April 11, 2012. All photos are copyright ©Jeff Lindsay, 2008-2012, and are the property of Planet Lindsay, LLC. Please request permission before using photos for any purpose.